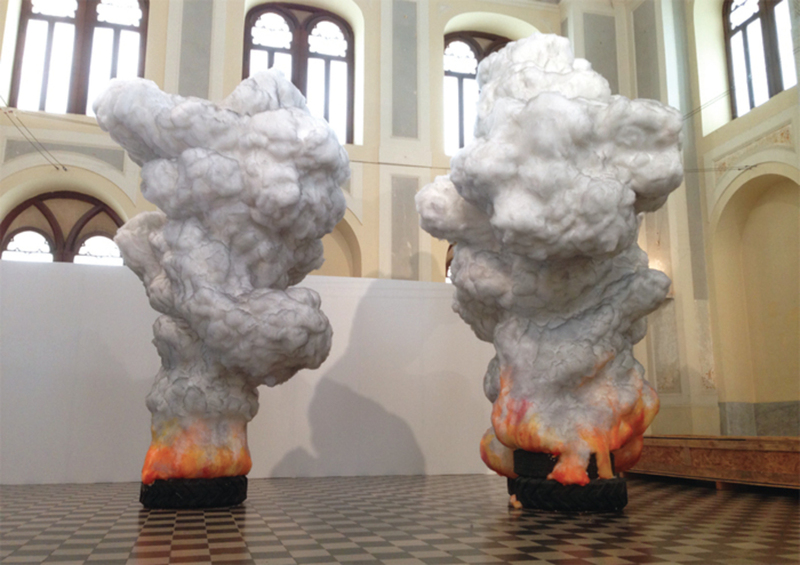 Gal Weinstein, Fire Tire, 2010/2013, wax, natural and polyester wool, styrofoam, graphite, 14' 9“ x 19' 8 1/4” x 9' 10". From the 4th Thessaloniki Biennale of Contemporary Art. Geni Tzami Mosque. Conveying the complex movement, conquest, persecution, and integration of people, the Fourth Thessaloniki Biennale of Contemporary Art is centered on the trope of the Mediterranean itselfa nexus of flux, trade, and conflict linking peoples of different religious and cultural traditionsand installed in historic spaces around the city. The central exhibition of the show, “Everywhere but Now,” curated by Adelina von Fürstenberg, speaks of widespread diasporas and the binding myth of the fatherland through stories of populations that have been dispossessed and victimized.